"I'm quite sure you mean well, inspector, but if you imagine that I am going to sit back and let everybody regard me as a dotty old maid, you are very well mistaken." Although there have been many adaptations of the mysteries and thrillers of Agatha Christie, certainly some of the most beloved (except by Christie purists) are the early 1960s quartet of Miss Marple films starring Margaret Rutherford. She makes an indelible impression as Christie's amateur detective, a stout and elderly spinster who is an inveterate reader of mystery novels. Assisted by her nervous librarian friend Mr. Stringer (Stringer Davis, Rutherford's husband), who is a creation of the screenwriters rather than Christie, she solves crimes that police inspector Craddock (Charles Tingwell) is unable to piece together. 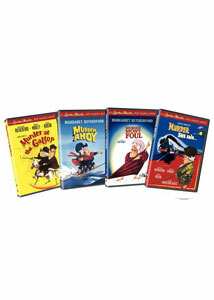 This boxset collects all four of these classic films, which at least initially are not available separately (though each keepcase does have its own UPC). But if you want one, you're likely to want them all. The first outing, Murder She Said (1961) gets things off to a rousing start. While riding a train, Miss Marple sees a young woman being strangled on a passing train, but Craddock refuses to believe her. With Mr. Stringer, she finds clues leading to the Ackenthorpe estate. Lacking any other recourse, she presents herself at the manor as the new maid and tries to resolve the mystery of who the victim was, who killed her and why. All of the Marple films have excellent supporting casts, and this is no exception, James Robertson Justice makes a big impression as the hypochondriac patriarch of the Ackenthorpes, while Thorley Walters (who would go on to star in numerous Hammer horrors) contributes as a suspicious family member. Arthur Kennedy (who would have a significant role in Lawrence of Arabia the next year) is featured as Quimper, the family doctor. The story takes advantage of England's class structure, since Miss Marple as the maid is able to freely eavesdrop while the family ignores her like a piece of the furniture. As is the case with later films in the series, it delights in its Britishness from beginning to end, and contains plenty of whimsy, though not to excess. Ron Goodwin's amusing musical theme makes its initial appearance here, and its bubbly infectiousness makes it impossible to resist. It cleverly represents the aged Marple's coexistence in the modern world by placing a harpsichord over a 60s pop beat. Murder at the Gallop (1963) involves another family determined to kill each other off over an inheritance. Based on Christie's After the Funeral (which actually stars Hercule Poirot, rather than Miss Marple), it features the Enderby clan, who meet at the family hotel/stable, the Gallop, run by Hector Enderby (Robert Morley). It's interesting on a number of counts, such as its self-referential remarks about Agatha Christie (Miss Marple suggests that her novels be required reading for the police), as well as one of the few instances where Miss Marple actually gets it quite wrong. The picture features a number of classic comedy sequences, such as Rutherford acting as a bootjack for Morley as she tries to check his boots for a critical clue, or her dancing to modern music with Mr. Stringer as she lays a trap for the murderer. The photography, by Arthur Ibbetson, is frequently moody and more striking than any of the others in the series. There's plenty of skulking around, but cat lovers may resent the thematic element of cats being terrifying. Among the suspects is Robert Urquhart, best known for The Curse of Frankenstein (1957). The final two Marple pictures were released in 1964. The weakest of the four is Murder Ahoy, the only one not at least ostensibly based on a specific Christie novel. In this outing, Miss Marple has been named to the board of trustees of the Cape of Good Hope Youth Reclamation Center, which runs a sort of floating reform school for young hooligans aboard the frigate Battledore. When one of the trustees is murdered by means of strychnine in his snuff, just as he was about to make a revelation about the ship, Miss Marple decides an inspection tour is in order. Soon the bodies are piling up, and poor Mr. Stringer finds himself a suspect. The story construction is rather awkward and the mystery forced; the killer isn't deduced by Miss Marple but simply reveals him or herself in the finale. It has all the air of being concocted after the fact to fit the title rather than vice versa. Lionel Jeffries rather overacts as the captain of the ship, and Inspector Craddock is reduced to knockabout comic relief. Things improve back on dry land with Murder Most Foul (1964), based loosely on Mrs. McGinty's Dead (oddly enough, another Poirot mystery transplanted to Miss Marple and her home turf of St. Mary Mead, or Milchester as it's called in the film). Miss Marple manages to hang a jury in the trial of the lodger accused of killing Mrs. McGinty. Determined that things are not as they seem, she deduces that the murder has something to do with an acting troupe called The Cosgood Players, led by H. Driffold Cosgood (Ron Moody, of Oliver! fame). But no sooner does she arrive than another member of the cast turns up dead, and Miss Marple may be next on the list. This is an enjoyable swan song for Rutherford as the detective, with plenty of droll humor. It makes much of the hammy nature of the troupe, with some good atmosphere contributed by Alison Seebohm as the ethereal and creepy Eva McGonigall. A definite highlight is Miss Marple's audition for the company, as she declaims The Shooting of Dan McGrew, which is just about as unlikely a piece for Margaret Rutherford as one can imagine. Also in the cast is Dennis Price (Kind Hearts and Coronets) as a theatrical agent who gives Miss Marple a few vital clues. The mix is delightful. Image Transfer Review: The anamorphic widescreen picture generally looks quite nice. The black-and-white photography comes across well, with excellent greyscale, detail and texture. There's very little visible damage on any o the films apart from the most occasional speckle. Digital noise reduction appears to have been used, occasionally to excess: when Miss Marple swings her golf club in Murder She Said, it vanishes from some frames. Audio Transfer Review: Each film features 1.0 audio tracks that are a little on the bright side and lacking in any substantial bass. Minor hiss is audible but doesn't really interfere with enjoyment. Extras Review: The extras are quite skimpy and duplicative. Each disc contains the same five trailers, for these films and another Agatha Christie adaptation being released the same day. Murder at the Gallop also contains both the UK and US versions of the trailer for that title. The trailer for Murder She Said is a chatty aside to the audience in the vein of Hitchcock's classic trailer for Psycho, but the others are pretty standard fare. Oddly, the first and third films are given the dual-layer treatment, while the other two rate only a single layer. Comedy meets suspense to excellent effect in this foursome of deft thrillers that make the most of Margaret Rutherford's talents. Call them mysteries that are enjoyable even by people who don't much care for mysteries. The transfers are fine, though the extras are scanty.